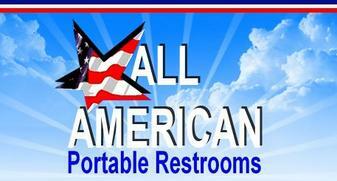 All American Portable Restrooms is locally owned & operated by long time Dickson residents Joe & Sue Friddle. Joe, a U.S. Army Veteran, served at Fort Campbell, Kentucky, as a paratrooper in the 101st Airborne Division, "Screaming Eagles", & has spent over 35 years in the building trades. At All American Portable Restrooms, we care about our customers & are dedicated to providing superior service, as well as the cleanest porta-johns in the business. Our porta-potties are American made; meticulously maintained; & serviced using the highest quality earth-friendly products in the industry. We are anxious to serve you, and are available for emergencies, disasters & many other portable sanitation needs. FREE Sanitizer & 2-Ply tp.